The Arakawa River has a small channel that flows into the Sumida River near the Suijin Bridge. Just north of this channel are two bridges crossing over the Arakawa River: the Shuto Expressway Bridge and the Horikiri Railway Bridge. The Horikiri Railway Bridge is a viaduct that includes three camelback truss spans over the Arakawa River. The Arakawa is substantially wider than the Sumida, which is its tributary. Consequently, bridges crossing the Arawaka are several spans long. The Horikiri Bridge is supported by squat, two-column reinforced concrete piers. It caries the Keisei Electric Railway Line that goes between Tokyo and Narita. The bridge was built in 1967. 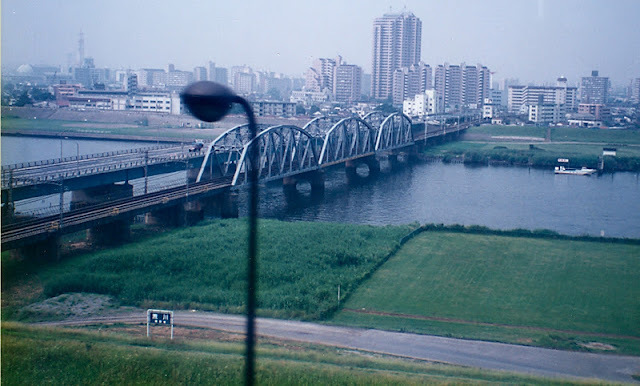 Tokyo's River Crossings: Horikiri Railway Bridge by Mark Yashinsky is licensed under a Creative Commons Attribution-NonCommercial-ShareAlike 3.0 United States License.